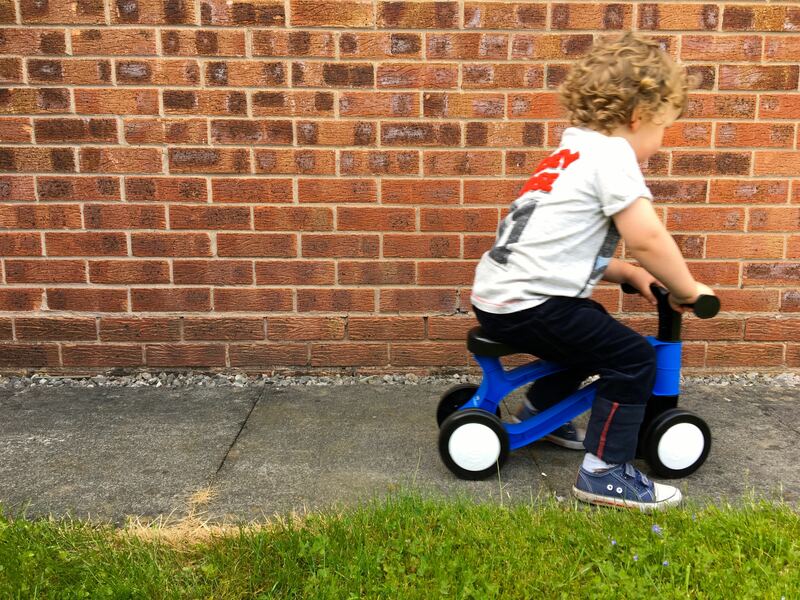 We were recently sent some post that had Alfie squealing with Joy… The Toddlebike 2! We’d had a couple of parcels that week, but none had been for him, so the look of pure delight on his face when I said it was for him was amazing. We’d had our Toddlebike delivered to a neighbour as we were at work. For a big box it was very light, in fact, it felt like nothing was in it! Obviously there was something in it… it is just that lightweight. It is however, quite sturdy, Alfie is a big 2 year old and it takes his weight and manhandling very well. 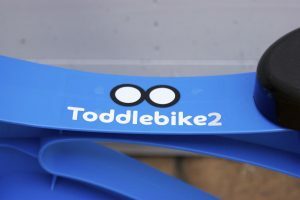 We picked the Toddlebike in blue, but it is also available in Red and Pink. It is bright and bold and perfect to catch a toddlers eye. Oh and on another note, it is so easy to wipe clean! Bikes can be scary things for parents with little ones. Are they going to be safe? Are they going to fall off? Can they do it by themselves? 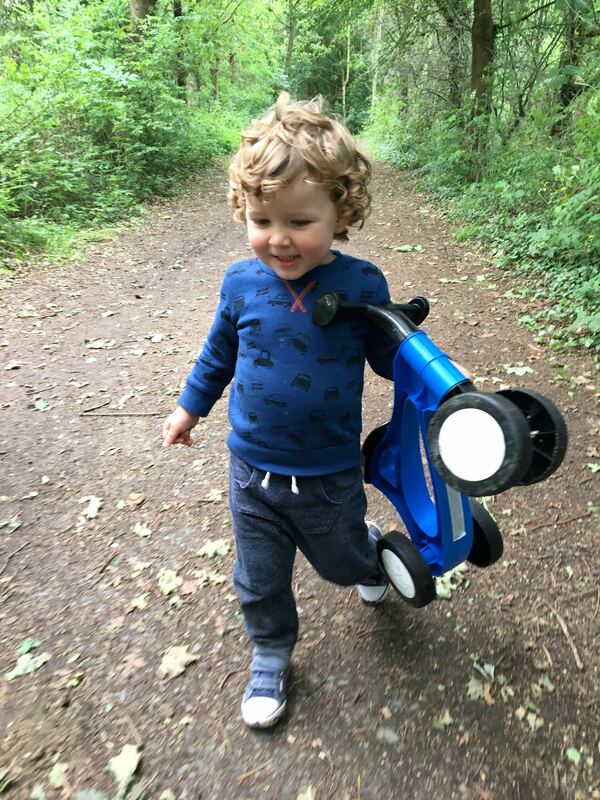 It did take Alfie a little while to get used to the Toddlebike. But he’d never ridden a bike before. Once he go the hang of it there was no stopping him. I see it as a bike before the proper bike. He’ll have good balance and control and will already know when he needs to stop! Or not if you are Alfie… he has a love of crashing into things! We are lucky in that we have quite a big front room, but also unlucky in that the ‘Great British Weather’ often hinders our plans. 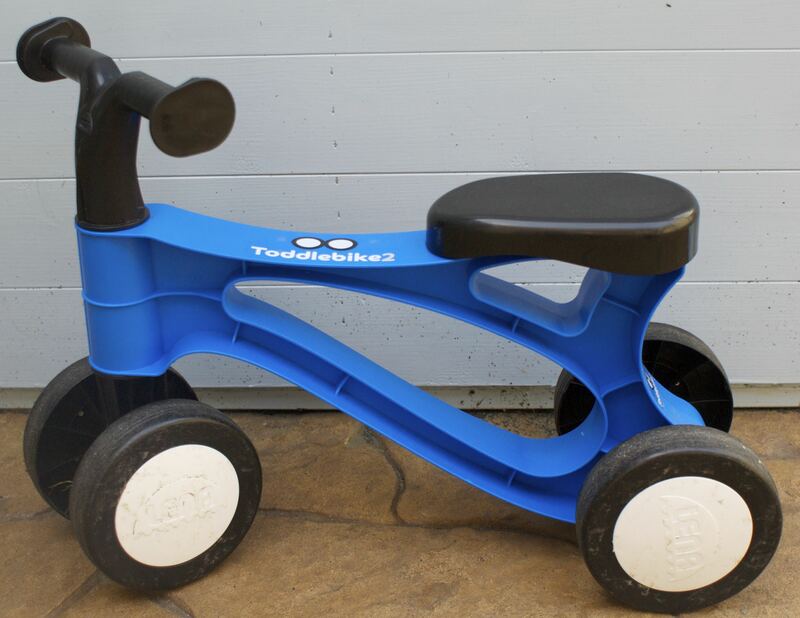 The Toddlebike 2 is perfect for indoors and out. Alfie flies around the front room, faster than I’d like, and even rides it into the kitchen whilst we make dinner. He’s even taken to using it as a chair whilst he watches TV! You know that feeling when your toddler/child says they want to take the bike to the park yet you don’t want to because you’ll end up carrying it home? Well, this is far, far from that. It’s so light and easy to carry, but hopefully Alfie will be happy riding it all the way home! We recently took it on a mammoth trip around Kingsbury Water Park. That included Alfie riding it through muddy puddles, on the grass, down hills, you name it. But it passed the test. Alfie rode it most of the way round and that is no mean feat, let me tell you! 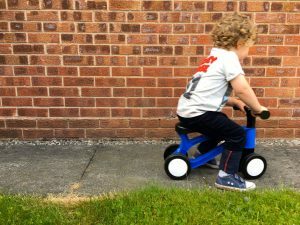 It really is the perfect ‘pre big boy bike’ so if you are wondering what to get we’d definitely recommend the Toddlebike! What a happy little boy exploring the forest. This looks like something our little girl would enjoy soon. I’m really looking forward to trying one of these, although I’m a bit nervous about any of my family going fast on a bike! This looks like so much fun! I just know that my Daisy is going to love a toddler bike!